So remember when you were a kid, and everything you and your family did felt unique? I think this was largely because the internet wasn’t as widely used, so we all used to feel pretty special about ourselves and our emotions and desserts we made. Then, when the internet became more widely used (and let’s be honest, memes became super popular), we all realised we weren’t as special or as unique as we thought we once were. Now, there’s a meme for practically everything, from how you eat pizza to how you wash your dishes. If you’ve done it before, so has someone else! 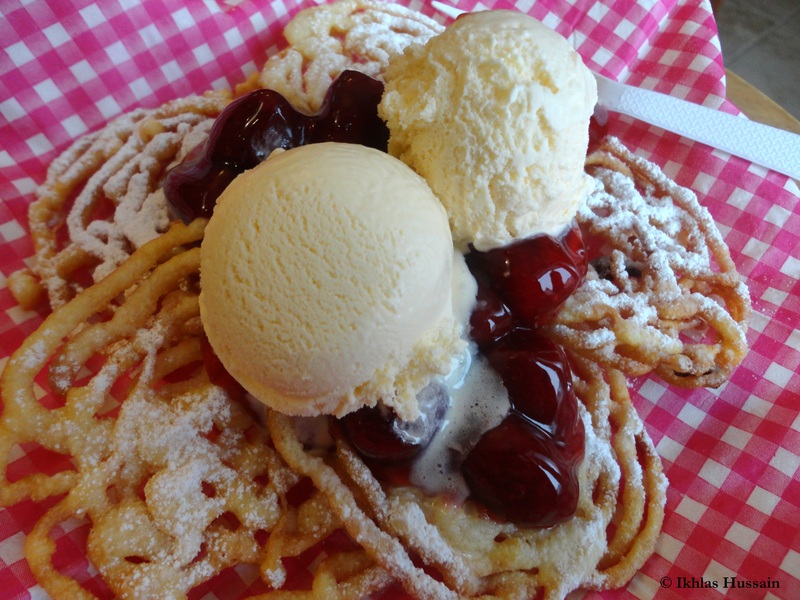 Despite knowing this, I still thought that Funnel Cakes were something that were specific to my town. Finally, I thought to myself, we have something unique to Canada! But alas, when I stumbled on this recipe a few weeks ago, it was like my whole world had shattered. 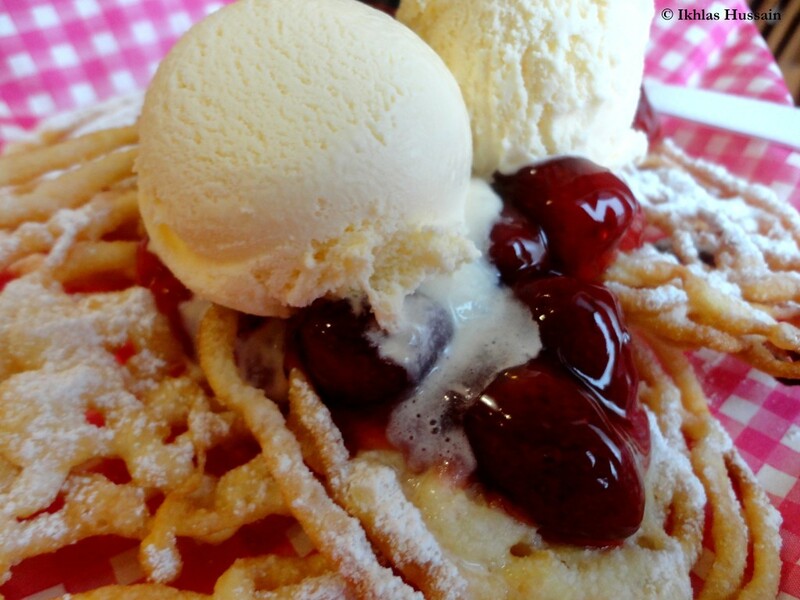 Other people also make funnel cakes?! It actually exists in the world?! You see, these beauties are sold at the only amusement park near my house, Canada’s Wonderland. It’s nothing special, especially now that I’ve been to Disneyworld and Universal Studios, but when I was younger, it was THE place to go. Summer couldn’t go by without me and my family going at least once to Wonderland, and a visit couldn’t go by until we ate Funnel Cake. They were sold by the plateful, and you had the choice to get icing sugar or strawberry toppings or vanilla ice cream or all three! And of course, everybody always got all three, because it was so good. Of course, you can’t eat the whole plate by yourself, and knowing that you’ll be sharing it with about 5 or 6 people made the $10 price a little more bearable. 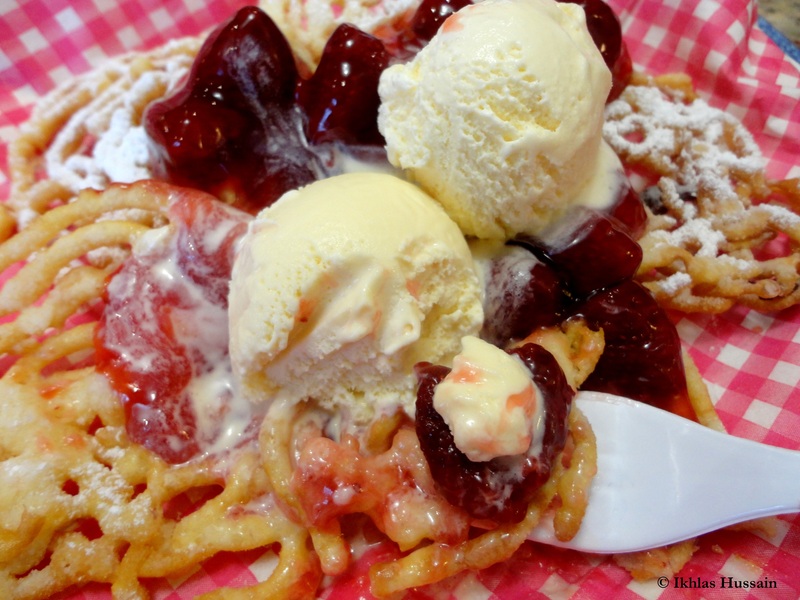 When I stumbled upon the recipe for Funnel Cake, I couldn’t resist recreating this childhood classic at home! Crunchy on the outside, but fluffy on the inside, when I first took a bite of these mini cakes, perched at my kitchen island, plastic fork in hand, I was immediately transported to my childhood, as I devoured a big plateful with my cousins during hot summers, the ice cream running onto the paper plate and onto our sunburned hands especially after a long, sticky day at the park. I hope you try them out! Sift the dry ingredients into a plastic jug, which will make pouring easier. In a small bowl, mix the wet ingredients together. Slowly, add the wet ingredients to the dry. Stir the mixture after each addition to ensure a smooth consistency and to prevent lumps at the bottom. The batter will be quite thick. Pour it into a squeeze bottle and heat oil in a deep frying pan. Place a round cookie cutter in the oil and squeeze batter in circles inside of it. Wait a few seconds before lifting the cookie cutter with metal tongs and repeating the procedure. Cook each mini cake for about 30 cakes to a minute on each side, or until golden brown. Let sit in a plate with a paper towel and sprinkle with icing sugar. Serve warm, and with warmed strawberry topping and vanilla ice cream. Recipe inspired by Bird on a Cake. 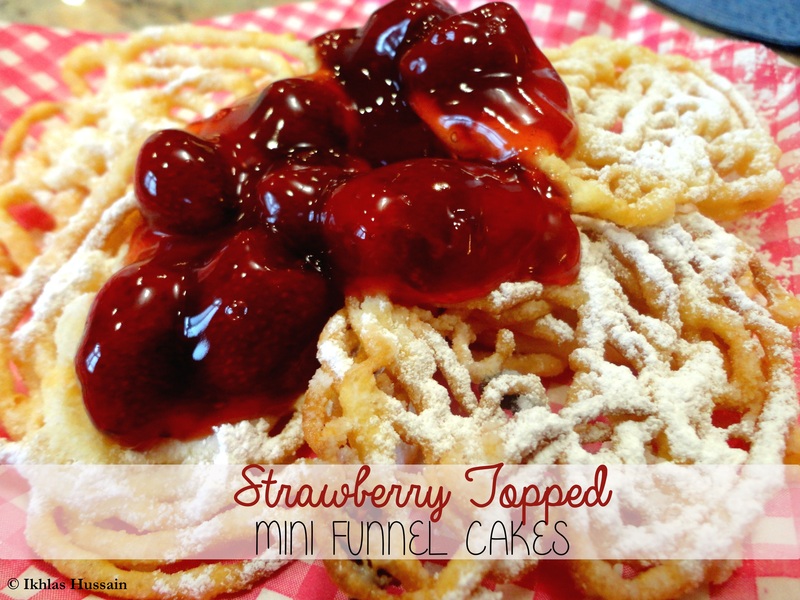 Served warm with a healthy sprinkling of icing sugar, warm strawberry topping and cold vanilla ice cream, these mini Funnel Cakes are delightful! They aren’t too sweet on their own, and the best part is adding any and all toppings you like. You can add warmed Nutella, whipped cream, jam, or just about anything! I decided to stick to the version I know from my childhood, which included a warm strawberry topping with mini strawberries and soft serve vanilla ice cream. I decided to take the shortcut and use canned strawberry pie filling and made do with regular vanilla ice cream. This entry was posted in Other Goodies, Recipes and tagged recipes, strawberries, sweet. I feel that way pretty much every time I make anything! I LOVE funnel cakes. These sound awesome! OMG! that strawberry sauce looks amazing, can you give me the recipe on how to make it. I’ve been searching through the internet for this! But all i got was puree strawberry sauce…. kinda disappointing. Hi Anna! Thanks so much for visiting. The strawberry sauce is just strawberry pie filling from a can. I use the E.D Smith brand when I make this recipe. Hope this helps!